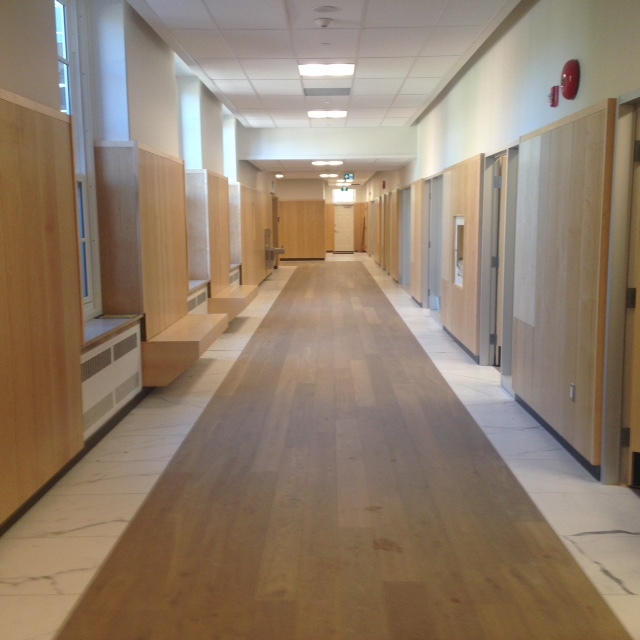 Old Boys returning to Upper Canada College for reunion festivities and other community members visiting the campus for Association Day on Sept. 26 will have a hard time recognizing the Upper School’s first floor. Much of it was gutted over the summer to make a number of changes and improvements. The principal’s office was moved to the former Jubilee Room around the corner from the front entrance. The staff common room was moved to the Colborne Room outside of the dining hall. Two faculty seminar rooms and a classroom were added along with a new boardroom. And the main office was opened up to the front hall. “All of this was done to make sure the administration was more accessible and available to the community,” says facilities executive director Steve Thuringer. The dated-looking tile walls and the floor in the hallway extending east from the Bernick Family Foyer have been covered with lighter and more appealing wood paneling, while new carpeting and more windows have been added. “The classrooms were renovated in the same way as those on other floors over the past two summers,” says Thuringer. “They were done in the same fashion as upstairs, with improved HVAC and improved lighting. While the major renovations have been completed, Thuringer expects the remainder of the work, including extending the foyer, to be completed over the next four to six months. No. 2 reason to attend A-Day: Don't miss the special announcement following Jim Power's performance at 11:30 a.m.
No. 3 reason to attend A-Day: It's always fun to watch the UCC Blues Varsity football team go head-to-head against the St. Andrew's College Saints. See yon on the Oval at 2:30 p.m. Be ready to make some noise! Zach Schwartz '05 is delighted to invite all Old Boys, students, parents and friends to join us as we celebrate everything that makes UCC great. Association Day will be a fun-filled celebration for the entire family featuring many new activities as well as great ones you’ve known and loved in the past. Jim Power, principal of UCC and Bruce Springsteen fan extraordinaire will join the faculty band to sing "Glory Days" and more. Got a group? Got talent? You’ve got to perform. A-Tunes @ A-Day needs you!. UCC talent will be featured on the main stage from 11 a.m. to 1:30 p.m. Old Boys, students, faculty and staff members are encouraged to participate. Dust off your old guitar, call up your buddies and come and belt out a few tunes. Interested? Please contact Peter Gray at pgray@ucc.on.ca to register your group. Click here for a full listing of A-Day events, times, locations and the athletic schedule. Please contact events manager Maria Karakoulas at mkarakoulas@ucc.on.ca or 416-488-1125 ext. 2231 if you have any questions. Nothing brings Old Boys together better than a little competition. And when that competition benefits current and future students, we're definitely game. UCC launched the reunion giving challenges in 2014. In this ultimate clash of the classes, we continue to pit each class celebrating reunion against one another. Who will come out on top as the most supportive class of the College? Last year the class of 1989, which was celebrating its 25threunion, was victorious with both trophies. Don’t miss the reunion dinner on Saturday, Sept. 26 to see if your class comes out on top when we present two shiny and new trophies. One will go to the class with the highest fundraising participation. ·The other will go to the class that raises the most in cash and pledges in a reunion year. Don't delay. The deadline is Friday, Sept. 25. Reunion weekend begins that day with class-specific events and a boarding reunion at UCC. The weekend culminates with the reunion dinner (for Old Boys only) at the College on Sept. 26. See how your class is doing by clicking here. Please click here to participate in this year’s reunion giving challenges. Our boarding community has plenty to celebrate this year. Not only do we have updated residences, we're thrilled to have surpassed our $14-million fundraising goal. Join your fellow boarders for a special cocktail reception to reconnect with old friends and tour our newly renovated spaces. The event takes place in Massey Quad on Sept. 25 from 5 to 7 p.m.
Register for this event by calling 416-488-1125. ext. 2226 or clicking here. We’re having a very special Think Ahead campaign celebration that’s not to be missed on Saturday, Nov. 21. Donors of more than $1,000 and Crown Link Society donors (Old Boys less than 15 years out of the College) of more than $500 are invited to attend. If there was ever the right time to donate to Think Ahead, it’s now. Click here to contribute today. Not sure of how much you’ve given? Contact Joanne Weedmark at jweedmark@ucc.on.ca or 416-488-1125, ext. 2000. Mark your calendars for this unique celebratory event. We have begun accepting applications for September 2016 entry, and our annual admission open house will take place on Wednesday, Oct. 28 and Thursday, Oct. 29. As an Old Boy, you can help play an important role in our recruitment process by telling talented boys and their families about the amazing opportunities at UCC, or by letting us know about talented boys. Contact us directly about a prospective student by calling the admission office at 416-488-1125 (SK to Form 7, ext. 4123; Upper School, ext. 2221) or emailing admission@ucc.on.ca. The College is also committed to honouring relationships with legacy families and applicants with siblings attending the school. We will interview any sons of Old Boys and siblings upon application. Thank you for being a proud UCC ambassador and helping your alma mater find great boys. There are several opportunities and ways to share your thoughts and opinions about the role and mandate of the next principal of Upper Canada College, including listening sessions and online submissions. The listening sessions provide an opportunity for you to share your feedback with members of the advisory council who are responsible for soliciting feedback from consultations with the UCC community. The advisory council will summarize and share the feedback from all consultations with the principal search committee. Using this feedback, the principal search committee will prepare the role profile for the next principal. Feedback received won't be attributed to any individuals. You’ll have an opportunity to sit and share your perspectives with one or two members of the advisory council and/or the principal search committee at these listening sessions. Although they're scheduled in conjunction with parent curriculum nights at both the Prep and Upper School, Old Boys and other community members are invited to attend. Your individual representatives — including Old Boys, parents and employees — will be on hand to receive your feedback. Additional sessions will be scheduled as required. We'll also arrange one or two sessions especially for Old Boys (likely using a webinar format to enable attendance for alumni from outside Toronto) and additional sessions for employees, as requested. What challenges, opportunities and/or priorities do you see for UCC and the next principal over the next several years? What experience, credentials, competencies and/or attributes should UCC be seeking in the next principal? Are there any individuals you would suggest should be invited to consider this role? Alternatively, is there someone you would like to suggest who wouldn't be a candidate, but who exemplifies the leadership attributes UCC should be seeking? Any discussions and all feedback will be strictly confidential and not attributed to any individuals. Your feedback will be gathered and summarized by the consultant and the advisory council and shared with the principal selection committee. If you aren’t comfortable sharing or expressing your views at one of the listening sessions, or if you're unable to attend, you’re welcome to go to the Principal Search web page and submit your thoughts through the confidential feedback form. We also encourage you to visit that page for ongoing updates on the search process. You’re also more than welcome to contact consultant Heather Ring at uccprincipalsearch@caldwellpartners.com.